CAUTION! It has been brought to our attention that pirated PROWLERS CDs are being sold on Amazon. Definition of pirated CDs: Also known as bootleg or counterfeit CDs, pirated CDs are CDs that are illegal copies of the officially released master CD and are not authorized or sanctioned by the copyright owner and are usually either DEFECTIVE and/or have POOR SOUND QUALITY. 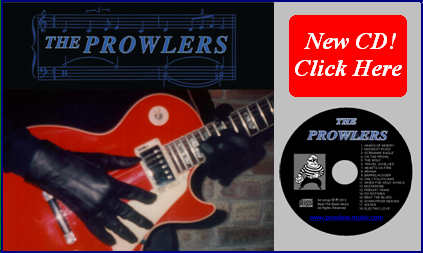 How to identify a Prowlers counterfeit CD: All authorized copies of the new Prowlers CD come in a cardboard digipak. 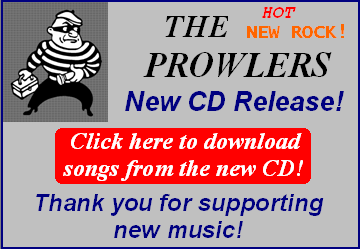 If you see the new Prowlers CD in a jewel case, then it is a counterfeit. However there may be variations depending on how the counterfeit CD was manufactured. You can also look for the DISC MAKERS logo on the bottom side of the CD next to the inner circle to make sure it is a legitimate copy. How to avoid purchasing a counterfeit CD: The best way to know you are purchasing a legitimate Prowlers CD is to buy it direct from our official distributor CDBaby - click here. CDBaby.com does an excellent job distributing CDs for thousands of independant musicians ensuring reliable and fast delivery. CDBaby.com is also where you will get the LOWEST PRICE when purchasing a new copy of our CD. We still support Amazon: Despite the risk of counterfeit CDs on Amazon.com, we will continue to support the distribution of our music on Amazon.com, since many of us shop there for convenience. Amazon has proven to be a great place to purchase music, but once again, BEWARE OF THE RISK OF PURCHASING COUNTERFEIT CDs. Once again, thank you for supporting independent musicians and thank you for listening to our music!